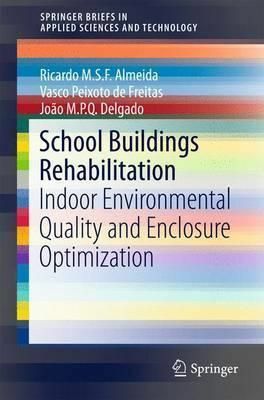 This book discusses the effect of different school building rehabilitation strategies on the classrooms' indoor environmental quality (IEQ) and presents a multi-objective methodology for school building enclosure optimization combining artificial neural networks and lifecycle costs. The special features of this book are that it (a) presents the state-of-the-art in school building rehabilitation, (b) covers the IEQ assessment of several school buildings, including non-rehabilitated and rehabilitated according to different strategies; and (c) proposes a multi-objective optimization procedure.The rehabilitation of a school building should be regarded as a procedure combining a number of (sometimes conflicting) variables and objectives, including energy, IEQ and costs (initial, operational and maintenance), in the search for an "optimum solution." The main benefit of the book is that it discusses the main topics related to school building rehabilitation, presents results of the IEQ assessment on 9 school buildings and launches a discussion on how the "in-use" performance of schools is key to understanding how designed performance is actually experienced. It maps the most commonly used multi-objective algorithms and artificial neural network architectures and proposes a methodology for combining these numerical tools with dynamic building simulations and lifecycle cost analysis to optimize school building enclosures. This methodology will be of value to scientists and engineers alike, while also addressing a variety of related disciplines, such as civil and mechanical engineering, architecture and mathematics.